All the inside pics and deets from Priyanka Chopra and Nick Jonas' private engagement ceremony! Priyanka Chopra and Nick Jonas got rokafied today morning in the most beautiful ceremony I’ve ever seen. While the whole world awaits for the big-fat engagement party tonite, here’s bringing you the inside deets from the intimate ceremony! 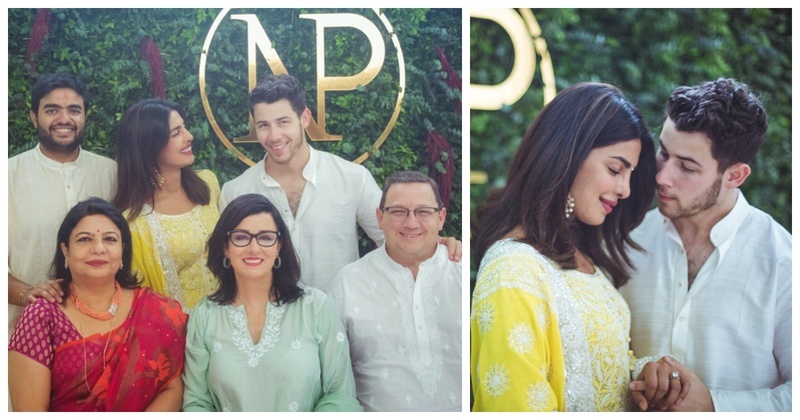 Chopra’s and the Jonas fam-jam in one frame and an NP logo in evidence that they are pulling all the stops over there. Peecee says, “The only way to do this... with Family and God. Thank you all for your wishes and blessings". What’s breaking the internet though is, when the ecstatic bride to be said, “Taken, with all my heart and soul”. This is the first ceremony in Jonas's and Chopra's Indian wedding: becoming formally engaged before their families. And this is exactly the way Chopra wants it, a source told to E! earlier this week: "Priyanka wants everything to be traditional to respect her family's values, and definitely an Indian wedding," All of the plans are moving quickly and Priyanka and Nick do not want to have a long engagement." Well, I hear wedding bells loud and clear and can’t literally wait for the engagement party tonite!